Google Maps is a web mapping application. With the technology of Google, the map embeds street routes, a route planner for hiking, car, bike or any public transport, and an urban business locator across most countries in the world. Google Maps play an important role in organic search engine optimization. The business can be located easily when they are enlisted in the map. A close variant of the Mercator projection is used for the imaging but this renders Google Maps incapable of showing areas around the poles. Relevant to Google maps is Google Earth, a program that offers more features and globe-viewing options. 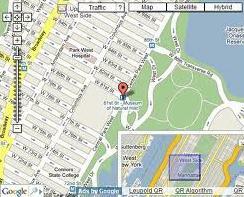 On 6th June, 2012, Google announced the new features of the Google Maps service. One of them is the ability to download the maps for offline viewing. But this functionality was assigned only to the users of the Android operating system. The talk has been rife between Apple and Google. With Apple planning to ditch Google Maps app, and launch something own, Google Maps upped their game with 3D mapping. This ensured their position in the mapping world. To build a more adequate map, the Mountain View, California has driven more than 5 million miles as their five-year quest. Named as Ground Truth, this would provide raw data to be incorporated in the maps. Google announced Street View Trekker, which is a portable pack of 360-degree camera that would be fitted in the backpack. The camera would be carried remote areas that are accessible only by foot and take the necessary images. Brian McClendon, Head of Google Maps, said that data would be more accurate. With high resolution 360 degree cameras, which are the size of soccer balls, have enabled capturing 20 petabytes of images of Street View cars, trolleys, tricycles, mounted on boats and trains. A fleet of planes working exclusively for Google would capture the 3D imaging. This would cover all the metropolitan areas. The offline mapping capabilities certainly are a blessing for those with erratic connectivity. A certain step forward, journeys can still be planned and locations deciphered even when offline. Although, no specific details have yet been revealed, Google Maps would move forward in the comprehensive, accuracy and usability sector, opening a complete new dimension towards progress. The announcement came days before the Worldwide Developers Conference of Apple. The company is rumored to announce for the replacement of the maps developed for iOS including the iPhones. McClendon was peppered with questions of how this move by Apple would disparage the services, and why was there existing difference between Android and iOS. His reply was that he would soon ensure Google Maps to be compatible in all platforms. When specially questioned about the disparity of the offline option for the Google maps, McClendon briefly announced that iOS users could soon expect the same. He said, that statistics stated 75 percent of the people could now view their home versus a meager 37 percent six years back. McClendon is positive with the new developments. He concluded by saying that though no one can ever build the perfect map. But, Google Maps is definitely a step closer!